The mustard business carried on as a sideline to the main businesses of chemists and soft drinks. It passed through the generations of the family, from Thomas and Frederic James, Williams sons, the T& FJ of the company name, to the current Stephen Taylor, the founders great, great grandson. Very little changed over the years. The first major change was in 1940 when the containers were changed. 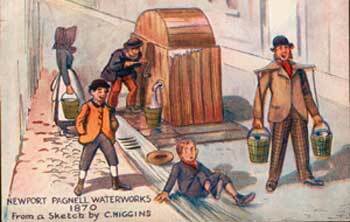 NEWPORT PAGNELL WATER PUMP A postcard showing a drawing of the original waterpump. From pictures of the period the pump seem to have been sited outside Taylors shop. It has been said that William Taylor owned it, but this cannot be proved. Until then the mustard was sold in stoneware jars which became unobtainable and were replaced with amber glass jars. These were chosen as they look fairly similar and are still used today. The company now believe that if they changed to clear glass, sales would fall.